Who doesn’t love mashed potatoes and gravy? We certainly do, but for our latest endeavor we wanted to reinvent this classic into something fresh and exciting – and these babies are certainly a show stopper! 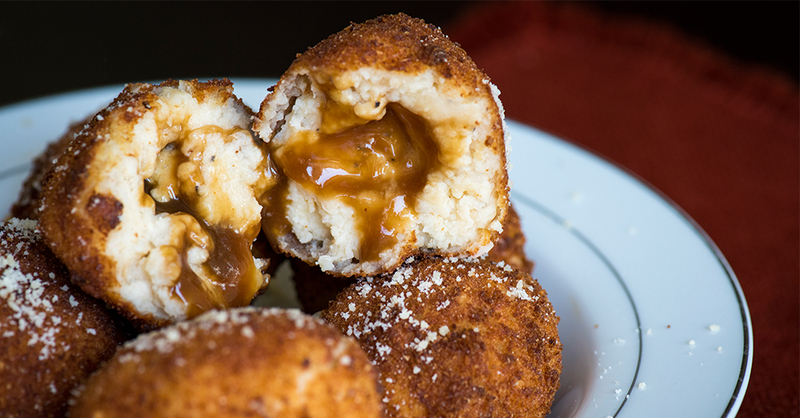 The trick to getting the gravy inside each bomb is to freeze it in ice cube trays. The gravy melts as the balls fry up, and the parmesan cheese gets nice and melty as well, yum! These little gems are packed with flavor, and are a ton of fun to snack on as an appetizer or side dish. If your family is anything like ours, these will be gobbled up in no time! Pour gravy into an icecube tray and freeze until solid, 1-2 hours, or overnight. Remove from freezer and cut each cube into 3-4 smaller pieces, if using a large ice cube tray. Set up a breading station by placing flour, eggs, and breadcrumbs into three separate bowls. In a large bowl, mix together mashed potatoes, cream cheese, parmesan, garlic powder, cayenne, salt, and pepper. Wrap 2-3 tablespoons of potato mixture around one gravy cube. Roll each ball in flour, then dredge in egg mixture, and lastly bread crumbs. Repeat with remaining potatoes and gravy cubes. In a large pot or skillet, heat 3-4 inches of vegetable oil to 375ºF. Making sure to not overcrowd the pan, fry potato bombs in batches for 3-5 minutes, or until golden brown. Transfer with a slotted spoon to a paper towel-lined dish and let drain. Pre-Workout Fuel: When and What Should I Eat?